I’m taking some time off the next few weeks to spend with my family and our new bundle of joy. In the meantime, I’ve set up a few posts ahead of time to share. 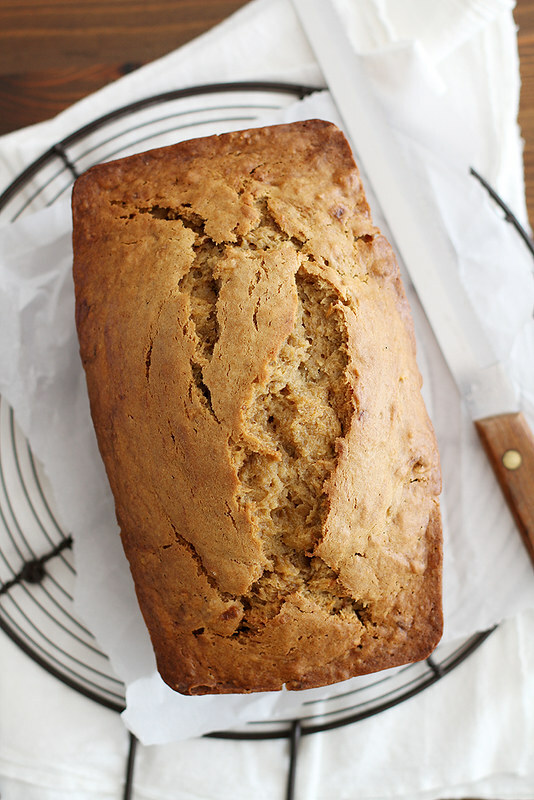 This cookie butter banana bread has been a looooong time coming — but was worth the wait. A warning: be prepared to go full-on Cookie Monster on this bread once you get a waft of it. What is this? Two banana-based recipes in a row?? Surely a food blogger wouldn’t allow this redundancy! Except that one involves pie and the other (hint: this one) involves cookie butter so I think we can all agree: Mmmk, yeah, two banana recipes in a row is A-OK. This recipe has been a thought bubble (I originally typed “buttle” — what? SLEEP DEPRIVATION YOU SLAY ME) in my head for a really, really, ridiculously long period of time. And I don’t really know why I kept putting it off; though it probably has something to do with the fact that I’m allergic to naners and I knew this bread would be amazeballs and it would be torture of tortures to bake it and smell it and watch my husband eat slice after slice AND then declare it may be the best bread I’ve ever made. Spoiler alert: All of the above happened. Harrumph (I mean, hooray!). At least I could console myself by eating spoonfuls of cookie butter. If you’ve never tried cookie butter before, we can’t be friends. JOKES. We can totally be friends — but I will introduce you to cookie butter. It tastes just like those Biscoff cookies of magical, miraculous, heavenly deliciousness you get on airplanes but it’s spreadable and spoonable and quite honestly one of the best things about life as we know it. If that’s not enough of a ringing endorsement for you to get thee to the grocery store and pick up a jar or 5,000, I don’t know what is. Except that it tastes even better in banana bread. 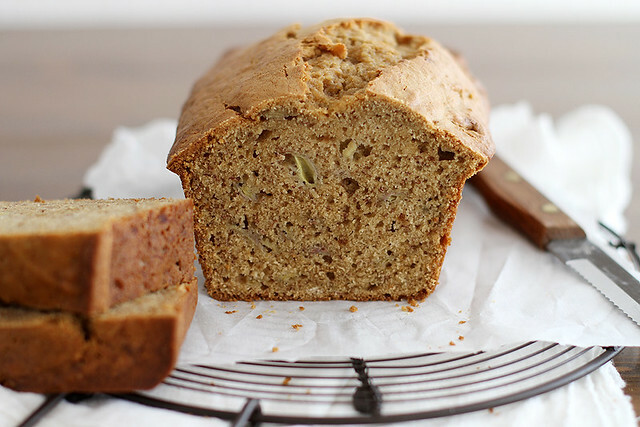 As any good banana bread should be, this loaf is dense, soft and full of flavor. 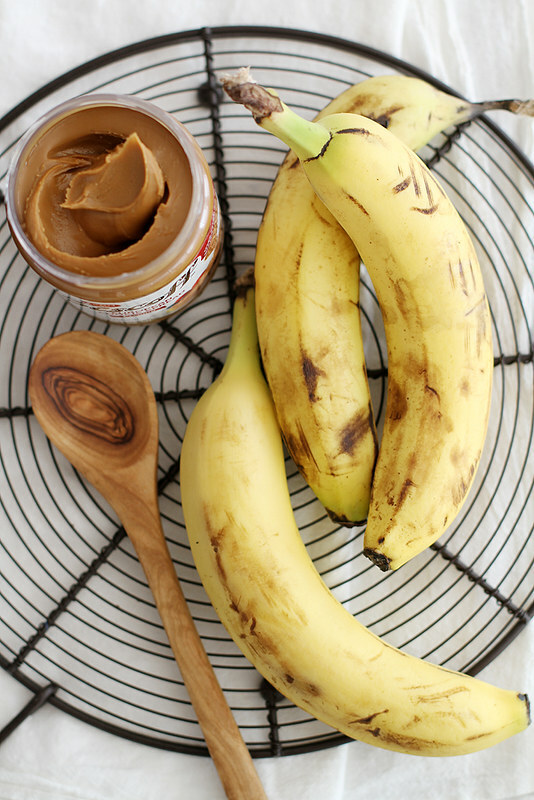 The banana and cookie butter flavors both come through in every sweet, yummy bite and, like a fine wine or cheese, it tastes better with age. So I suggest baking a few loaves — one for the freezer, one for the kitchen counter and one for your immediate gobbling needs. And there will be immediate gobbling needs. Heat oven to 350 degrees F (325 degrees F if using a dark or nonstick pan). Grease and flour the bottom and sides of an 8 ½-by-4 ½-inch OR 9-by-5-inch loaf pan. In a large bowl or bowl of a stand mixer fitted with the paddle attachment, stir together flour, baking soda and salt until combined. In a separate large bowl, mash bananas until smooth. Add sugars, cookie butter, milk, oil, vanilla and eggs. Whisk until combined and mostly smooth. Pour banana mixture into flour mixture; stir until just combined. 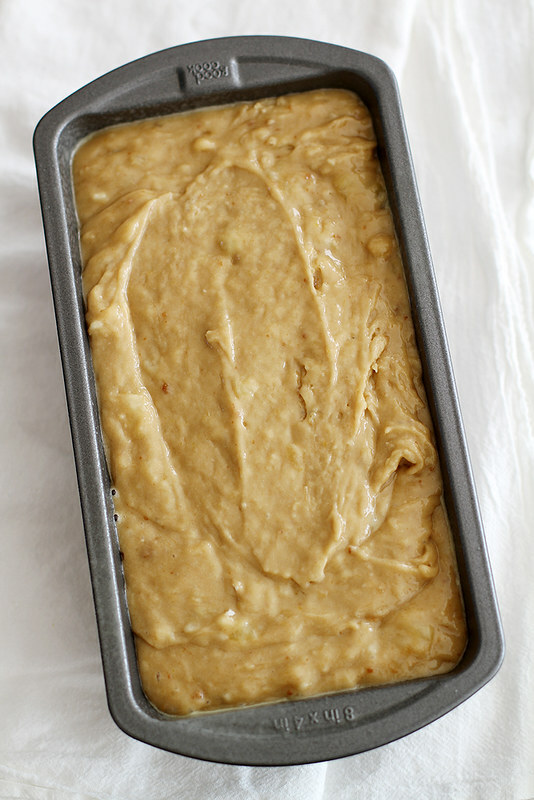 Pour batter into prepared loaf pan; smooth top with a spatula. Bake 1 hour 15 minutes until deep golden brown and a toothpick inserted in the center comes out clean. Tent with foil during baking if the top of the loaf is browning too quickly. Cool bread 10 minutes in pan, then transfer to a cooling rack to cool completely before slicing. *NOTE: I used an 8-by-4-inch loaf pan but it baked a little bit over the pan and left a weird lip, so I’d suggest going with the 8 ½-by-4 ½-inch or 9-by-5-inch loaf pan size for better results… though the 8-by-4-inch loaf is just as tasty. Psst — want more quick bread goodness? My eCookbook will do the trick! Cookie butter is addictive. Making this bread so so dangerous. OMG. I could not be trusted alone with this. So good! This bread is incredible. It has such a beautiful lift and golden color. And the ingredients are insane! Love! This is brilliant! I love cookie butter with bananas. As if I needed another reason to obsess over cookie butter!! This bread looks delicious! This looks amazing. I love that it’s so crusty on top and moist inside. And I have a jar of cookie butter in my cupboard just asking to be used to make this! Banana bread recipe rule, but this version?? Too go to be true!! Love this! The words cookie and butter are the only way to survive a Monday. Looks amazing! I STILL have not tried cookie butter, if you can believe it! I’m a ginorm fan of naner bread, and am totes cool with adding some cookie butter. Want to eat this for all the meals! YES! This is my new favorite banana bread. I just know it. I can already tell this is going to a staple recipe in my house! Yum!! This bread looks absolutely amazing and something I’d LOVE with my cup of coffee in the morning!! could I use peanut butter in place of the cookie butter? One can never have enough banana recipes! I’m sorry to hear about your allergy but thank you for thinking of us and creating amazing banana recipes anyway! This looks so beautiful, Stephanie. Your photos are incredible and that loaf – it’s perfectly fluffy and moist inside. I can just taste how good the cookie butter and banana flavours go together. I hope you get more sleep, lady! Yes please! I have a jar of cookie butter in my pantry that I purchased for ‘baking’ but has been slowly destroyed by the spoonful. This bread is the perfect excuse for a fresh one! Banana bread should always include cookie butter! Yes to Cookie Butter! 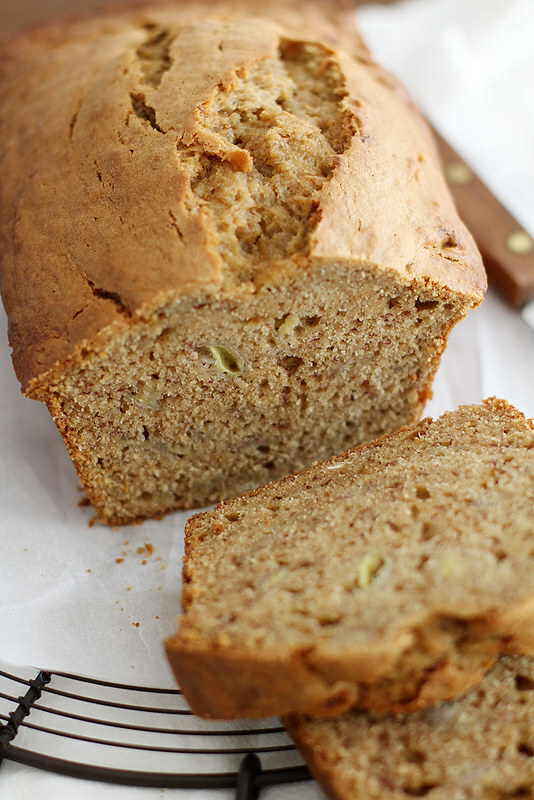 I’ve actually been craving banana bread for a while, this could be the perfect thing. 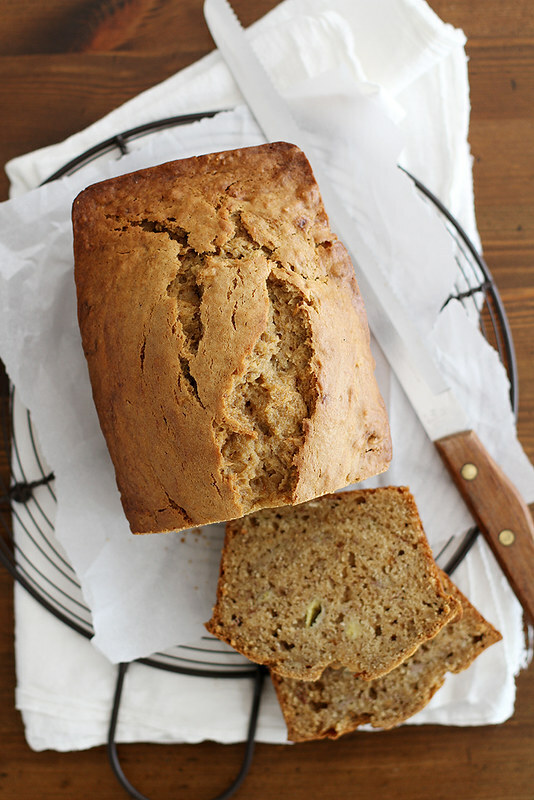 I think I have found my new favorite banana bread! There is always room for more banana recipes!! LOVE this idea!! Holy heck! Ok, I just tried cookie butter for the first time like a month ago! Obviously I fell in love with it. What a creative use of it Stephanie! How delicious! that’s terrible that you made this and then couldn’t even taste it. So sad! This sounds absolutely amazing!! I love banana bread, and the cinnamony cookie butter is probably phenomenal in there. Love! Eating spoonfuls of cookie butter has been known to cure all sorts of things. This bread looks amazing! This looks like one of those bread recipes that you keep telling yourself that your are ONLY going to have one more slice——repeatedly. I love the honey color of it. I just made a double batch of this. AMAZING!!!!! So moist!!!!! Hmm… this sounds delicious. I am curious: could you add chocolate chips? I haven’t tried the cookie butter, so I’m not sure how the flavors would mix… Thoughts? Has anyone tried this? Claire — So glad you liked it!